EXCLUSIVE: Twenty gender equality and environmental organisations, including trade unions and consumer groups, have called on the European Commission to ignore a hit list of proposals that business lobbyists want ditched by the new executive. Pending EU rules to guarantee gender balance on boards, extend maternity leave, reduce air pollution, and introduce a Financial Transaction Tax (FTT) should be axed because they damage the competitiveness of European companies, BusinessEurope told Commission First Vice-President Frans Timmermans three weeks ago. Timmermans is the man President Jean-Claude Juncker has put in charge of cutting red tape and delivering “better regulation”. He is currently analysing about 130 pieces of pending legislation left over from the Barroso Commission to decide if any should be dropped. The EU’s Circular Economy Package, which includes laws on waste and landfill, should be “withdrawn and re-tabled as an economic piece of legislation”, BusinessEurope said in a communication, exclusively revealed by EURACTIV. They later published the statement. BusinessEurope had “concerns” about rules on mining in conflict regions being expanded or being made binding, and said the EU Emissions Trading System, the cornerstone of the EU’s drive to reduce greenhouse gases [see positions below]. The European Women’s Lobby, Friends of the Earth, Oxfam International, Greenpeace, the European Consumer Organisation (BEUC), Action Aid International, UNi Europa, Solidar, WWF, Climate Action Network and the European Health Alliance were among the 20 groups signing the point by point rebuttal of the BusinessEurope statement. The NGOs said they objected to the “narrow assertion” that business competitiveness would be hampered by legislation protecting people and the environment. “We believe, as do a vast number of progressive companies, that the only way for European industry to be competitive is to innovate with the limits of a low carbon and resource efficient economy, and to embrace strong social, labour, consumer and environmental protection measures,” the letter said. The NGOs called on the European Commission to ensure the screening took environmental, social and health benefits into consideration as wells as the costs and benefits to business. “Rights and commitments enshrined in the EU treaties, such as women’s rights, worker’s rights and environmental protection must be upheld,” the letter said. Splits in business community over Circular Economy? On 21 November, the World Business Council for Sustainable Development, wrote to Timmermans, expressing their support for the Circular Economy package. “Driving resource efficiency in the EU requires clear policy decisions; the Circular Economy Package offers the necessary platform to improve resource reuse in Europe,” the letter said. The signatories to the letter include business giants including Apple, Coca Cola, Shell, Siemens, Ikea, EDF and many more. Read>> List of World Business Council for Sustainable Development members. BusinessEurope responded to our original exclusive. Read their response below in full. "We and our members support President Juncker and his first vice-president in screening 130 pending legislative proposals in order to identify which proposals should be pursued and which should be withdrawn. This is in line with the EU’s drive to comply with the principles of subsidiarity and proportionality. "Therefore BUSINESSEUROPE supports the swift adoption of a number of draft legislations but is critical of a few others. For example the introduction of a Financial Transaction Tax (FTT) would undermine the overall aim of financial stability and dampen (even more) investment and confidence. "Air quality policy in Europe consists of a number of different legal and regulatory measures. As experience in the past has shown already, the risk is high that the industrial sectors will be held accountable if non-industrial sectors (eg agriculture) do not deliver their share. "On draft legislation on emissions of certain pollutants we are in favour of further improvement of air quality in Europe. Our members do commit to these efforts. However we still see unaddressed concerns, especially because of the lack of proportionality between costs and benefits and proper evaluation of the impact of concrete emission limit values. "We are in favour of promoting the objective of better gender balance in boards. However, we do not support a one-size-fits-all EU approach that does not take into account the subsidiarity principle and disregards the diverse national approaches to this topic, as well as sector specific problems. 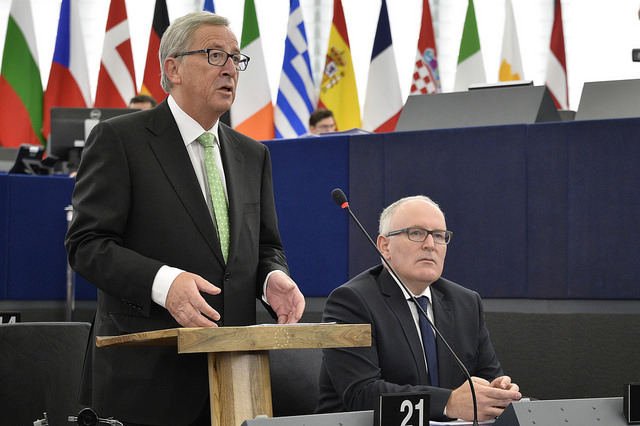 Commission First Vice-President Frans Timmermans has been given a mandate from new Commission President Jean-Claude Juncker to cut red tape and deliver “better regulation”. He is currently analysing about 130 pieces of pending legislation left over from the Barroso Commission to decide if any should be dropped. BusinessEurope is an EU trade association for business interests. It describes itself as, "the leading advocate for growth and competitiveness at European level, standing up for companies across the continent and campaigning on the issues that most influence their performance. A recognised social partner, we speak for all-sized enterprises in 33 European countries whose national business federations are our direct members." Sanp: “oh dear, all those big company snouts in the rough fearful they may loose their taxpayer funded acorns” NGOs are not funded through taxation, but by donation. In the case of BusiEurope they are no longer representative of the interests many of their members – which is why Unilever left.